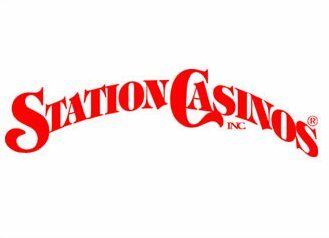 Do online slots hold the (room) key to internet poker's future? We’ve long believed around these parts it’s all about slots. Not that we play the no-armed bandits, but more and more often it seems like we won’t get fully legalized online poker in the United States until we have legalized online slots. While play-for-free slots are nothing new in our gaming space — Zynga’s been getting 13-year-old kids to learn the gambling foundation that is slot play for more than a year now — what is new is attaching your pulls to casino comp points, which effectively serve as a casino corporation’s own private currency. And you can see that advancement in some of the ads Facebook is serving up to at least a few of us. Winning, Stealing, Counselling, Facebooking, Partying, and saying Goodbye. 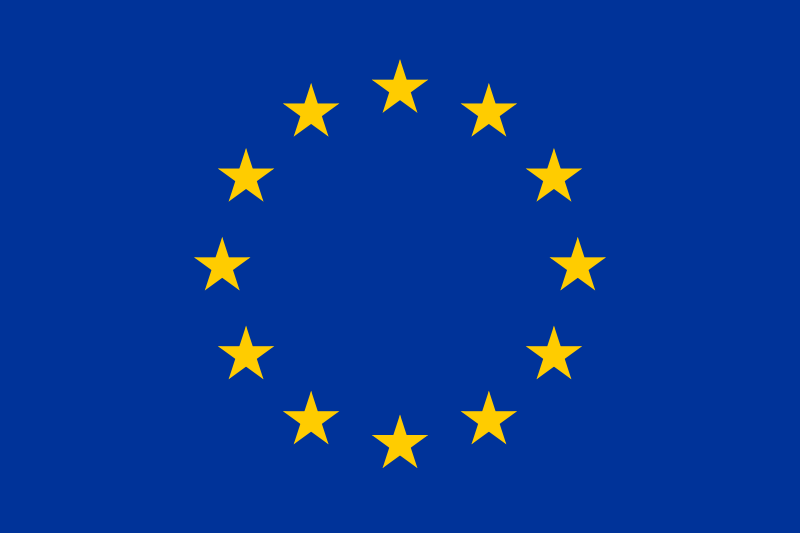 Excuse me while I shed my Union Jack trousers and put this flag back into its pouch. The Olympics are over and the unseasonal wave of athletic patriotism that has washed over the UK is finally abating. It’s a relief, let me tell you. Now we can get back to moaning about the transport network and being rained on. If only the sun would stop shining. Ah! I forgot that we still had the Paralympics to come. It’ll take me a full week to reaffix all my British paraphernalia. Which is conveniently just about the right amount of time for the wider world of poker to generate enough news for another post. Serendipity at its finest. This week, Facebook launched a real money bingo game, with slot games close behind. What could this mean for affiliates? Also, New jersey gets sued over sports betting, and Maryland abandons thoughts of online gambling. Facebook for Real Money Gambling! This Week in Gambling: Facebook for Real Money Gambling! Hold on for the ride of your life! 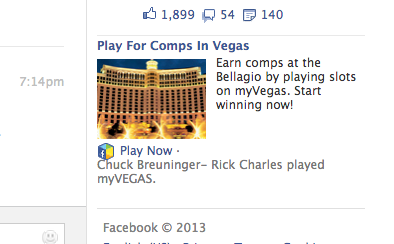 Just when the online gambling industry thought it had seen everything, Facebook enters the market! The social site just launched a real money bingo game, and more games are on the way! Plus, New Jersey gets sued over sports betting and Tribal Gaming prepares to get online. 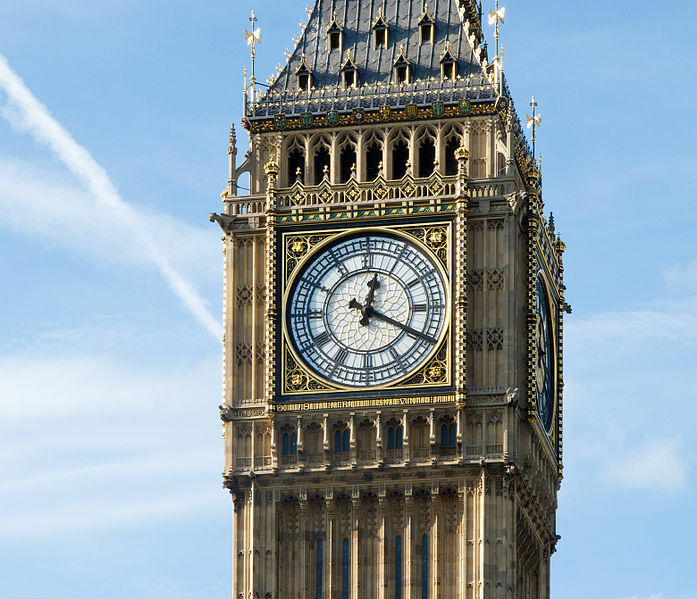 Ivey’s new home game, German PokerStadia, and exciting news for UK Facebook gamblers. This week we’re heading back to Macau – the Las Vegas of the Orient – to discover why Phil Ivey was really hanging out at the APPT. Here’s a clue: It has to do with playing poker for stupid amounts of money. Plus, a social media development that will surely plunge my homeland into an endless spiral of degeneracy or, alternatively, transform the nation into a utopia of Teutonic smugness. Depends on how the cards fall. Screenshot from the WPT’s Texas Hold’em Facebook game … words along the bottom suggest it might sometimes play like real life. 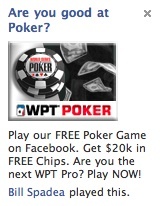 WPT Texas Hold â€˜Em Poker is FREE to play on Facebook. Get a $20K chip package when you join the game and play with your friends and poker buddies on Facebook. You can create your own poker persona by using the Avatar Shop and play any range of table stakes. With nearly 2 million WPT fans already playing the game, it is a great place to practice your poker skills and have some fun. 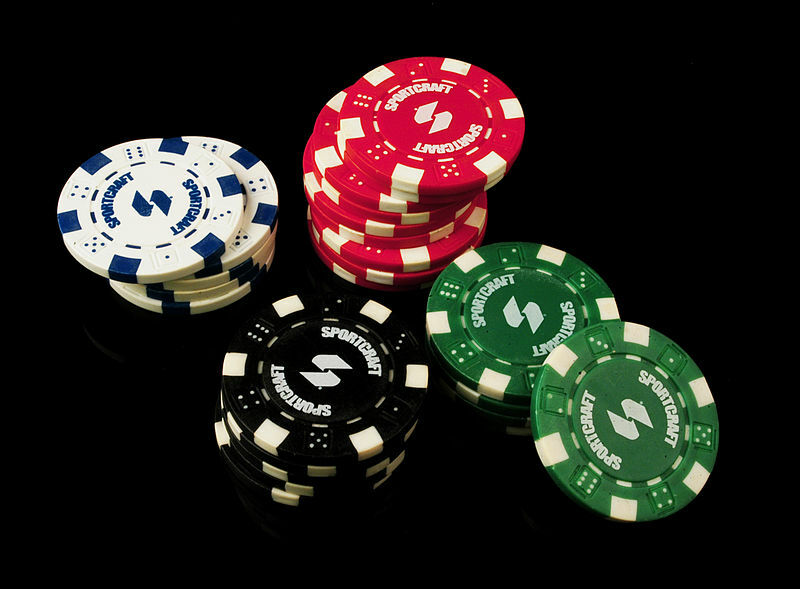 For tournament lovers we offer a 3-round Shootout Tournament where 2,000 chips can get you 500,000! Come check it out and have some funâ€¦for free. Visit and Like the official application fan page here or go directly to the game here. An attempt to *own* social media gambling transactions? In last Friday’s twitfeed, my favorite tech-biz site Tech Crunch tweeted about their post “Is Zynga Trying To Patent Virtual Currency?” Apparently, the leviathan of multiplayer gaming networks — and big wildcard in the future of real-money online poker — filed a US Patent Application in March of this year in an effort to corner the virtual currency market. At least that’s my take. After reading the actual legal document, “Virtual Playing Chips in a Multiuser Online Game Network”, I gather what they are really trying to do is define and patent the purchase and flow of “Non-Redeemable Virtual Currency” as it pertains *specifically* to gambling on social networks. 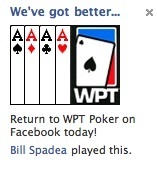 WPT Playing Dirty on Facebook? I think we all understand the nature of the WSOP’s push for their play-money online poker game on Facebook, which is being heavily advertised on commercials during ESPNs broadcast of the WSOP main event. People seeking more information, however, could be mistakenly led to the Facebook page promoting action with the WPT, arguably one of their biggest competitors for this market. Sure enough, it takes clickers to the official WPT Texas Hold’em Poker page. Careless mistake by a WPT social media intern … or conscious effort on days the WSOP is airing on ESPN such that they get the “likes” before Big Casino corporate lawyers make someone say “oops, sorry” and change the ad to something that doesn’t use tactics usually reserved for fly-by-night operations looking to make a quick buck? â€œWe would like to confirm that the Facebook ad mentioned in your September 17, 2010 post was indeed a mistake on the part of a 3rd party advertising agency used by our “WPT Texas Hold’em on Facebook” licensee. 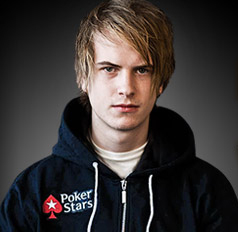 The ad was placed by the advertising agency without the knowledge of WPT or our Facebook game licensee. 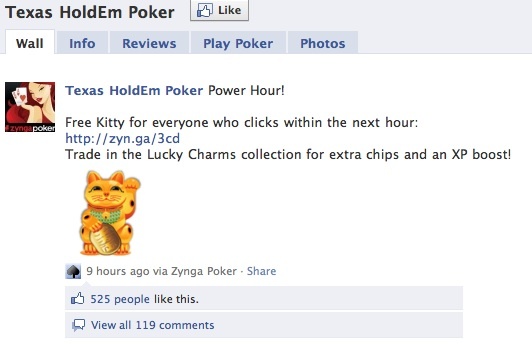 This isn’t particularly new — has been out there since August — but it’s the first I noticed … Zynga, the free Texas Hold’em game on Facebook and MySpace and therefore one of the biggest online poker communities out there, apparently has bots growing out the ying-yang. And now, as of about a week ago, after some fixes and revisions, it’s finally working well. It’s already had more than 88,000 downloads. If even just 1 percent of those are installed to fruition … well that’s a lot of bots competing for your fake chips and theoretically feeding the imaginary rake. And here’s a rockin’ video showing exactly how to install it. Hmm, interesting. More confirmation that bots are a real issue, and will be a major factor in future online poker operations. Also kinda funny to think that bot armies are essentially being trained playing free poker … where they theoretically can eventually work their way up in stakes like a human player who gets better and better. 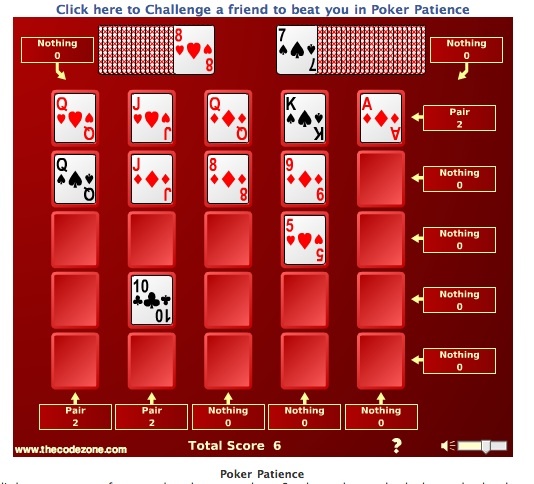 Facebookers can play (repeatedly, and compare scores with friends) here. 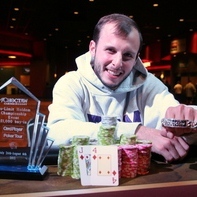 Play Money Facebook Hold’em Running Into Legal Troubles? Kinda-sorta. 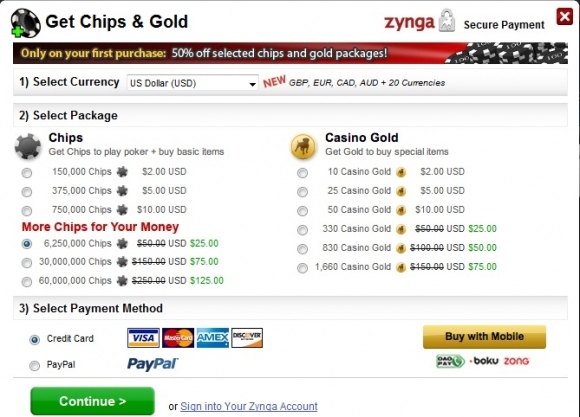 Zynga’s Texas Hold’em was the most popular game on all of Facebook — more popular than its sister games Mafia Wars, Yoville, and that farming game — which was all fine and dandy until people started hocking play-money chips on eBay. So now they’re apparently in the midst of a Facebook poker crackdown, looking to lock out multi-accounters, for example, and take play-money pushers to court. Conspiracy theorists say it has more to do with black-market undercutting of Zynga’s chip-selling business … but regardless, kinda effed up, not just because of poker, but because of the inevitable hubbub that seems to spring up whenever you see any semblance of a free market on the internet leading to unregulated virtual finance transactions.